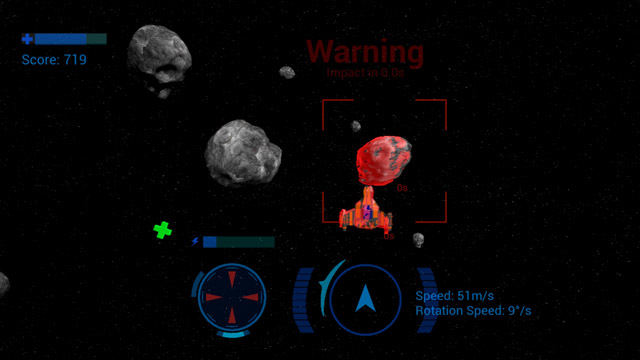 In the last three decades, I’ve played a lot of Space Shooters, from Asteroids to Starlost, but “Asteroid Survival 2095” from “DigitalDesignDev” still was a big surprise in almost every aspect. Read this review to find out what that means. If you don’t know how to play a game after reading the tutorial and trying it for about ten minutes, the game is either too complicated, poorly written or really something new. In this particular case, it’s a bit of option one and tons of option three. The Google Play description talking about “easy and smooth controls” is a barefaced lie, but I won’t send the developers to the gallows for that since steering your spaceship using the thrust of four different reaction engines is as innovative for the world of mobile gaming as space travel is for all of us. This brand new concept is a real eye-opener and the heart of “Asteroid Survival 2095”, that makes it so interesting to play. Also, the “forecast system” that predicts the flight path of the asteroids and your spaceship is a groundbreaking idea, that I’ve never seen in another Arcade space shooter. Even the perspective is of a new type. I’ve played dozens of vertical scrolling space shooters (e.g. Space Invaders) or first-person-space shooters (like Wing Commander – The Secret Missions), but I’ve never seen a space arcade game from a top-down perspective, in which you’re falling into the action. It’s a thin line between being innovative and creating something, that is too unwieldy, impalpable and awkward. Something, that is not designed to appeal to the masses or to be easily accessible. Something, that only Sheldon Cooper from “The Big Bang Theory” would enjoy. Unfortunately, “Asteroid Survival 2095” crosses this line a few times. 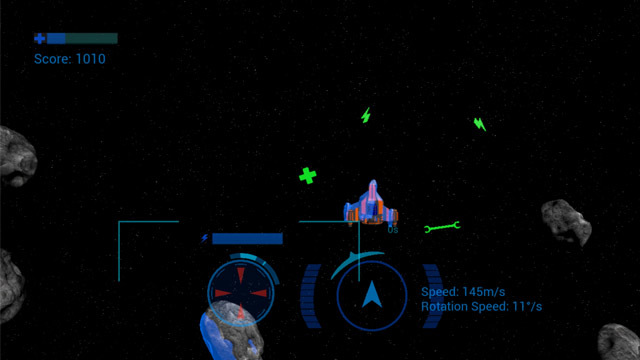 Having absolutely no sounds or music in an Arcade Space shooter might be scientifically correct, but it doesn’t help to make a game enjoyable. The unusual controls are a great example of an inventive mind, but I highly doubt that every user will be as patient and eager to try out new things as I am. Lastly, there is something, that even Sheldon wouldn’t accept. The name of the game suggests the existence of a story, a “lost in space” scenario, but there is simply nothing, that justifies the “Survival” or “2095”. You don’t know who you are, why you’re there and where you go. It’s a simple shooter without a background story and it shouldn’t raise false hopes. Maybe a better (video) tutorial? As promised, “Asteroid Survival 2095” is a big surprise. If you take your time to get used to the controls, you’ll discover one of the most innovative mobile games, that you’ve ever seen. Download it here, it’s worth it!